How Do You Spell WAIST? 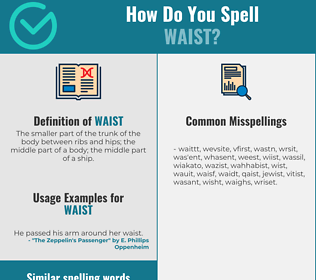 Correct spelling for the English word "waist" is [w_ˈeɪ_s_t], [wˈe͡ɪst], [wˈe‍ɪst]] (IPA phonetic alphabet). Below is the list of 343 misspellings for the word "waist". The smaller part of the trunk of the body between ribs and hips; the middle part of a body; the middle part of a ship.